Backyard weddings can be a lot of fun. Simon and Loida decided to tie the knot in the yard behind his parents yard in Davenport, Florida. 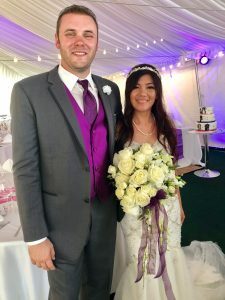 Simon is from the United Kingdom and Loida from the Philippines so when they met and decided to marry, they new it was going to be an international affair. With a great team of vendors the couple’s ceremony and reception were a blast to be a part of. Dan with Next Level Catering helped the couple put together an award winning team of wedding vendors. White Rose provided the DJ services at the ceremony, cocktail hour, and the reception. Michael and Nelson with Steven Miller Photography photographed everything from the getting ready pictures to the bride arriving in a vintage pink Cadillac on to the ceremony and the reception. I love you that you are my best friend, fiancé and minute to be my husband, and with you I can share my secrets and hidden thoughts and you will never judge me. I love you because you believe in taking and sorting rather than arguing and fighting. And I love you every time you wait for me till the middle of the night to make sure I’m home safely. And most of all I cannot imagines my life with out you. Congratulations Loida and Simon. Here’s to many many years in love.